If you join this forum to sell items or get price quotes only, you will be removed. So darned ugly! Billed as the most expensive 126 ever. Anyone have one of these, or experience with one? Might be a good catch from the collecting standpoint as I don't think it was a big seller. But as a shooter--I don't thin there is such a thing as a really sharp 126 image. The cartridge didn't hold the film flat enough for precise work. 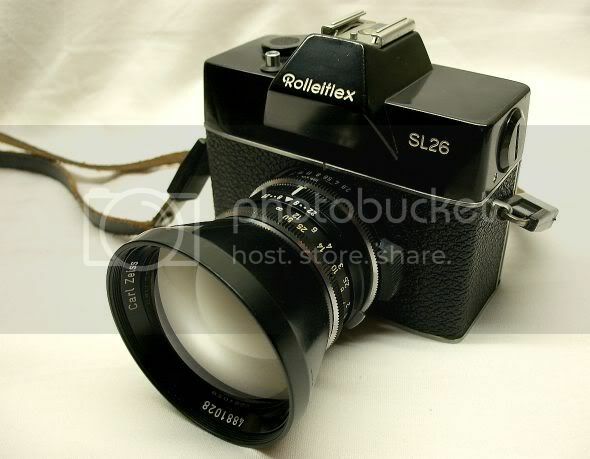 I got one of these "ugly" Rollei`s. It is reported that about 28.000 of the SL 26 have been made from 1968 till 1973 ( the early models in Germay, the later models in Singapure ). As Wayne said, this was no big seller, because a professional or amateur photographer did`nt wont to take pictures with a film made for beginners. I made pictures with mine long time ago, but surprisingly they came in a good image sharpness (Unfortunately i lost the pictures) and the 126-film is no longer available in Europe, so for me the SL26 is a collectors item and a strange piece of german photo-history. The failure of the 126 cartridge to hold the film accurately in the film plane was because of the inability of Kodak's (or whatever company was contracted) plastic injection moulders in the 1960s to maintain the original design dimensions. The same lack of accuracy applied to the mass-produced plastic bodied cameras to take 126 cartridges. The only excuse that can be used is cheapening for mass production. Surprising really, because camera bodies with a highly accurate dimension from the lens to the film plane were made by Argus (IRC) about 1936, about the same time that inexpensive precision plastic injection moulded components were being mass produced in Europe. Maybe Kodak should have gone to Ann Arbor, Michigan, or to Kodak AG in Germany for its cartridges. The 126 cartridge was designed for Kodak by the brilliant Austrian engineer Hubert Nerwin after he left Germany to work in the US first for Graflex and then for Kodak. It was while he was with Kodak that he patented the 126 cartridge, filing his patent application first in 1962. It was granted in 1964. Nerwin was an engineering prodigy. After qualifying at Linz university he worked for IBM and then Siemens before becoming, at the age of only 31, head of Zeiss Ikon's camera design team. His first job was to redesign the very troublesome Contax I. 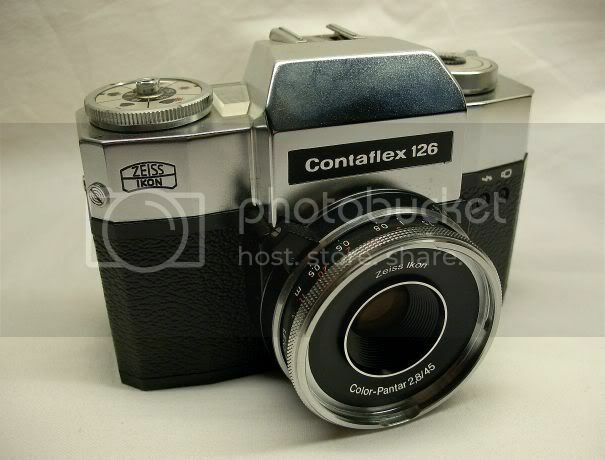 The result was the brilliant Contax II, almost a completely different camera. He also designed the Ikoflex and the very complicated, and very expensive, original Contaflex 35mm twin lens reflex. During the war, when Zeiss Ikon was engaged on war work, Nerwin designed, as a private venture, a single lens reflex version of the Contax which he named the Pentax from PENTa prism conTAX. His drawings were destroyed in the bombing of Dresden but his idea was revived by his successor after the war but with a horizontal cloth shutter and M42 lens mount. This eventually became the Pentacon from PENTAprism CONtax. The name Pentax was sold to Asahi in Japan. After bombing of Dresden, Nerwin and his family moved to the west where, with the 'new' Zeiss Ikon in Western Germany he designed, among other cameras, the lovely little Contina. In 1947 after his contract with Zeis Ikon expired he and his family emigrated to the US under "operation paperclip" where he worked first for Graflex and later for Kodak where he designed the 126 cartridge. Steeped as he was in precision engineering Nerwin must have been very disappointed with the definition of pictures produced by even high quality 126 cameras. When he designed the cartridge he must have had in mind the high-precision inexpensive plastic injection mouldings made in Germany during the 1930s and 1940s. Here's a copy of his original patent drawings for the 126 cartridge. It was the failure to maintain the critical tight-tolerance dimension between parts 82, the film plane, and 83, the seating face for the cartridge in the camera, that resulted in loss of definition. On the rest of the cartridge the tolerances were very wide. I developed a number of rolls of 126 back in the days. It fit fine on 35mm reels. The big difference was the film stips weren't as long and the film only had perfs on one edge and there weren't as many. I had forgotten Zeiss made a 126 camera. Your article is very interesting ! I didn´t know that an austrian designed Zeiss-cameras and invented the 126-film. Shoot 'em all - let Fuji sort 'em out !!!! European Board Co-Owner of The Camera Collector. Rachel UK -- Cats leave pawprints on your heart. Well, I can certainly say from my perspective that the VF is *charming* ... but beautiful, Rachel? Let's just say I respect your perspective. Peter, I absolutely love your article! What is your background, sir? Where do you get this sort of fantastic background information? My background? Where to start? I feel this is likely to be a long posting. After leaving university and serving just over two years in the RAF as an aero engine fitter I spent a couple of years training as a precision engineer before getting a job with Rolls-Royce - not the job I applied for as an engineer but in the design drawing office in the Service Division in London. This was in 1954 if I remember rightly. After three years R-R moved the office up to the Midlands but by that time I was married and neither of us wanted to move so I left and joined the design office of Scammel Lorries. When that company was taken over by Leyland I didn't like the new management so I moved to a firm of engineering design consultants. Finally in about 1964 I decided that after 10 years I'd had enough of pushing pencils around drawing boards. I'd been developing freelance writing for a few years and got a job with the publishers Illiffe and Sons, later part of the huge IPC publishing empire, as a technical and industrial journalist. In the meantime both my wife Valerie and I had become interested in old cameras and we joined the Camera Collectors Society of Great Britain. My journalistic work was taking me all over Europe including eastern Europe behind the infamous Iron Curtain, and I met other journalists, mainly German, who were also interested in old cameras. I never had any problems going into or coming out of East Germany. As well as my UK Press Card I had a Russian card which identified me as an accredited journalist with permission to take undeveloped film out of Russian controlled territory. These two cards seemed to open any border controls. Probably through a combination of my journalistic instinct of telling the story through people and my earier work as a design engineer, I became almost as interested in the people who designed and made the cameras as much as the cameras themselves. I collected loads of information from all sorts of places and noted it all down in a series of notebooks. 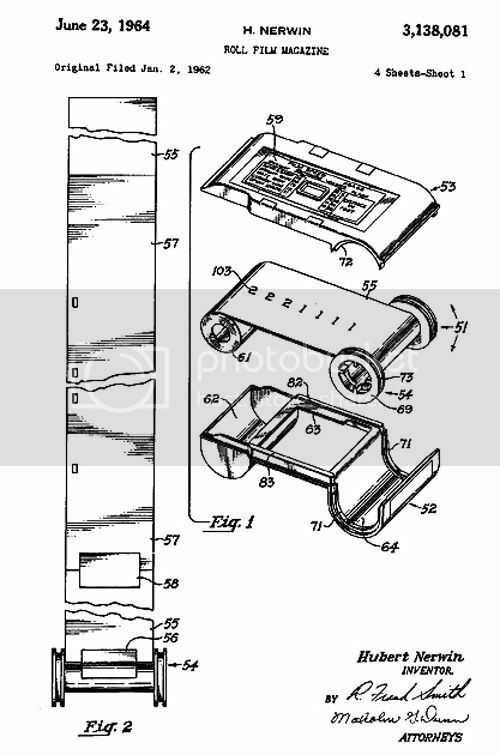 It was while I was digging around the history of Zeiss Ikon that I found out about Hubert Nerwin so I persued his career further and found that he designed and patented the 126 film cartridge after leaving Germany and going to work in the US. My job was taking me away from home a lot and I was missing my children growing up so in 1979 I resigned my position with IPC and went freelance. I made fewer and fewer trips into mainland Europe and concentrated on writing for UK publishers including about a dozen books on restoring classic cars, another of my hobbies. I'd also collected lots of books about the history of photography and cameras plus masses of old magazines. 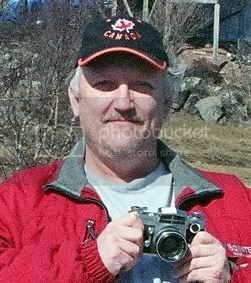 Sadly my wife died in 1996 and now at 81 I do very little writing for publication but I still carry on, with help from my son, a small publishing business reprinting old out-of -print books for collectors and enthusiasts on all sorts of subjects, and a picture library on much the same sort of subjects. I have a fairly large old 19th century house but still have problems storing all the reference material I have collected over the years. My son and his wife and children came to live with me as I can no longer get around without crutches. They bought me an electric invalid buggy which means I can get around the town and take pictures when the weather's reasonable. And that's about it. A fairly long and varied career during which I've picked up all sorts of useful and useless information. All my life I've been very lucky in being able to do the things that interest me and being paid to do them. Fascinating and inspiring. Thank you, Peter. Mik, I have to admit, the camera looks pretty darned good in your image. All that Zeiss glass makes camera hound blush. Perhaps, Drako, I'm a little biased My first 35mm camera was a Praktica IVF so I have a certain fondness for the model. A bit biased myself, you're not alone Rachel. Off the camera subject, from what I understand, Leylands management was awful. Looking at it from an American perspective, they were basically responsible for the destruction of the British car industry as a viable entity.